In this image provided by the Santa Barbara County Sheriff's Department, marijuana bales are pictured scattered on a beach. 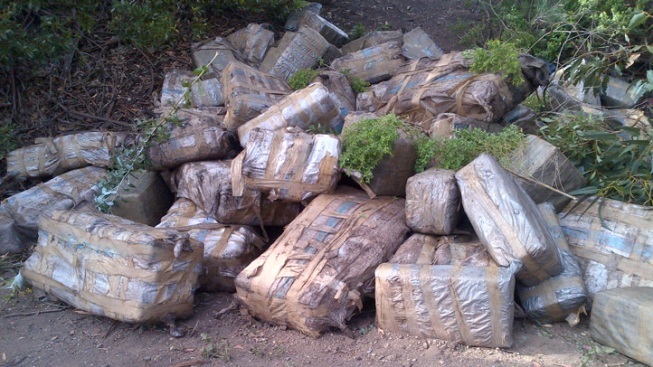 About 2,000 pounds of marijuana was found in about 50 bales on a beach in California Sunday after a panga-style drug smuggling boat washed ashore. The bales were found on Arroyo Camada Beach in Santa Barbara. The 30-foot panga boat (pictured, below) -- an open, outboard powered boat -- equipped with about 20 fuel containers was found on the shore. The 50 bales of marijuana have an estimated street value of about $4 million, according to the Santa Barbara County Sheriff's Department. The drugs were found partially hidden in bushes near a road leading from the beach. About 20 panga-style boats have landed on the Santa Barbara County coastline during the past two years, according to the sheriff's department. The boats are commonly used to transport drugs and other contraband. The boat and fuel containers were turned over to federal agents. Santa Barbara Sheriff’s narcotics detectives seized the marijuana, which was wrapped in plastic. A sheriff's canine unit searched the area, but authorities have not located the smugglers. In December, U.S. Coast Guardsman was killed when he was thrown from a boat that was rammed by a panga boat under investigation for smuggling off the Southern California coast. Drugs onboard the panga were seized and two smuggling suspects were taken into custody.